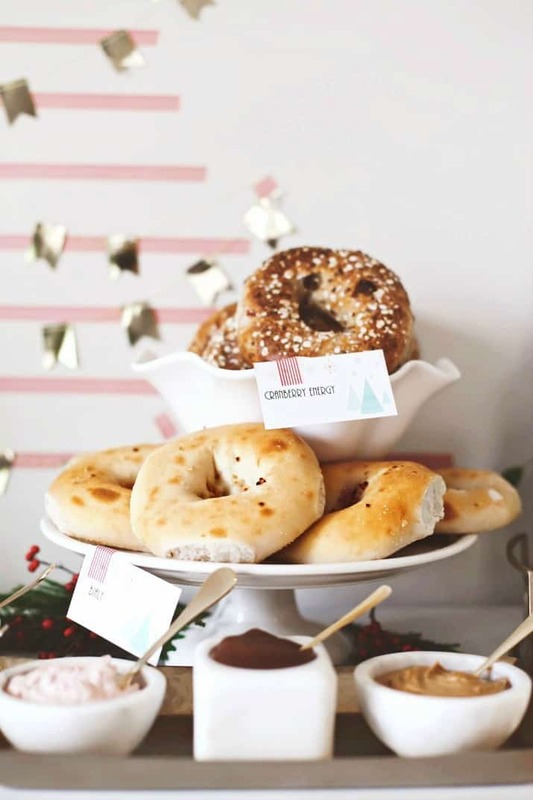 Set up a Holiday Bagel Breakfast Bar for Overnight Guests and make hosting easy. Whether your entertaining for Christmas or for Hanukkah, these authentic New York bagels are sure to hit the spot. Get the ideas and tips here. This post has been sponsored by New Yorker Bagels, but all opinions are entirely my own. If you’re looking for solutions for hosting overnight guests for the holidays, I’ve got you covered. Not only is it important for you to get your guest room ready, you also have to make mornings easy and convenient. That’s why I love setting up breakfast bars where guests can help themselves. Set up a holiday bagel breakfast bar for overnight guests and let them enter the day at a leisurely pace. This breakfast bar is easy on the host too, because you can have these New Yorker Bagels delivered right to your door with FREE OVERNIGHT SHIPPING! That means you spend less time at the grocery store or running errands while you still get fresh authentic New York bagels. Plus, everything on the site is currently on sale for the holidays. In addition, you or someone you love can enjoy these bagels any time with some special gifts and promotions I’ve got for you. Keep reading for details. Let’s talk about some ideas for your holiday bagel breakfast bar. While you can certainly follow my tips for the ultimate bagel bar brunch, this holiday version is more paired down and geared towards convenience. Toppings are kept to a minimum while still providing savory and sweet options. And accompanying items include two easy protein options and a festive coffee eggnog punch. Make sure to provide some protein in your holiday bagel breakfast bar, for balanced nutrition. The New Yorker Bagels are all vegan and certified Kosher. There are healthful options like Quinoa Multigrain, Cranberry Energy and four varieties of Whole Wheat. As well as decadent flavors like French Toast, Apple Cinnamon, and Bialys. To top the bagels I set out veggie cream cheese and smoked salmon with sour cream, capers, and pickled onions. For the sweet side I added strawberry cream cheese, apple butter, and peanut butter. Each topping provides a different flavor profile. Build a box of 12 bagels from there list of 22 different flavor varieties here. Because balance in meals is important I always like to add some protein to breakfast. Here the smoked salmon is served alongside Canadian bacon. Canadian bacon is quicker and easier to cook than regular bacon. It’s also leaner! To round out our bagel bar I made coffee eggnog punch. I’ll be sharing that recipe soon, but just know that you can serve it with or without alcohol. You can also set up a holiday hot bar with coffee and hot cocoa. If you’ve ever had a real New York bagel you probably know how special and delicious they are. On our trip to New York last summer we fell in love with them, piled high with schmears of cream cheese! What a delicious set up!! Love it! That’s mouthwatering. Every guest should appreciate the meal well-presented like that.